Are quasars and star formation linked? Authors: D. G. Bonfield et al. This figure (from Gebhardt et al. 2000) shows the relationship between a galaxy's bulge luminosity and the mass of its central black hole. Apparently, larger black holes reside in larger bulges. In astrophysics as in any other field, there are certain buzzwords that one hears frequently. One of the hot topics in galaxy formation and active galactic nucleus (AGN) research these days is “feedback” – the idea that the evolution of a galaxy is connected to the activity of the supermassive black hole at its center. One of the strongest pieces of evidence for AGN feedback is the apparent correlation between the mass (or luminosity) of a galaxy’s bulge and the mass of its central black hole (see e.g. Magorrian et al. 1998; Ferrarese & Merritt 2000; Gebhardt et al. 2000). 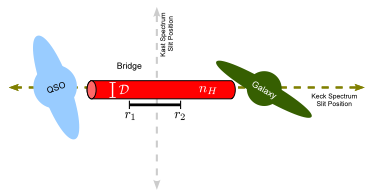 Shown in the figure at right, this relationship implies that there must be some common processes regulating the growth of a galaxy and its central engine. Figuring out what these processes are is no easy task. In the past decade, a number of scenarios involving various types of gas accretion, galaxy mergers, star formation, and different types of AGN activity have emerged, each adding more pieces to the puzzle. One of the large questions that has arisen is how star formation in a galaxy is affected by the presence of a quasar at its center. Does the quasar tend to shut off star formation in the galaxy? Or are the two usually seen in conjunction, fed by the same accretion processes? One way to approach this question is to try to separate the light from quasars and their host galaxies, in order to look for correlations between the two. This is challenging, because quasars are so bright that their luminosity usually overwhelms that of their host galaxies at near-infrared and optical wavelengths. To circumvent this problem, the authors of this paper used the space observatory Herschel to gather light at wavelengths which should be uncontaminated by the quasars, and use it to study the connections between host galaxy star formation, quasar luminosity, and redshift. For this study, the authors use the science demonstration (SD) data from the Herschel Astrophysical Terahertz Large Area Survey (H-ATLAS). Although only about 3 percent of the final survey area, the 16 square degree SD field is still large enough to contain 372 quasars, identified from either the Sloan Digital Sky Survey (SDSS) Quasar Catalog, or the 2dF-SDSS LRG (luminous red galaxy) and Quasar spectroscopic catalogue (2SLAQ). The authors use the SDSS and 2SLAQ data to get quasar luminosities and redshifts. The Herschel data is used to separately obtain far-infrared luminosities – a proxy for star formation. The authors then define the relationship between these three quantities by assuming that the infrared luminosity depends on the optical quasar luminosity and the redshift according to power-laws: . The maximum-likelihood value of will then point to the relationship between star formation and quasar luminosity, while will describe how star formation evolves with redshift. 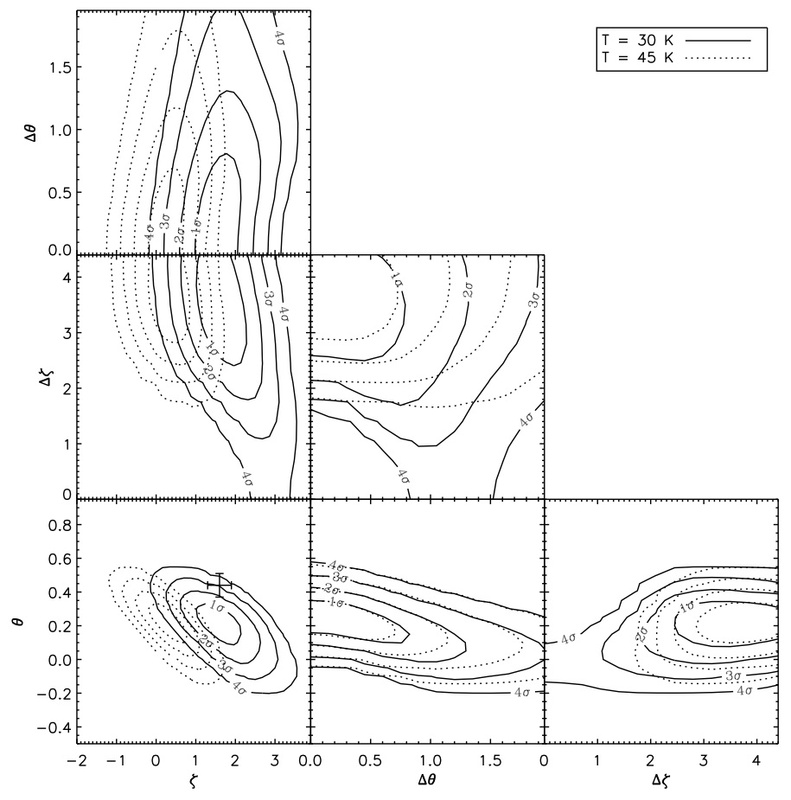 This plot shows the maximum-likelihood contours for theta and zeta at the 1, 2, 3, and 4-sigma levels of confidence. In addition, it shows how changing the assumed dust temperature causes a degeneracy with redshift (the contours shift along the zeta direction). 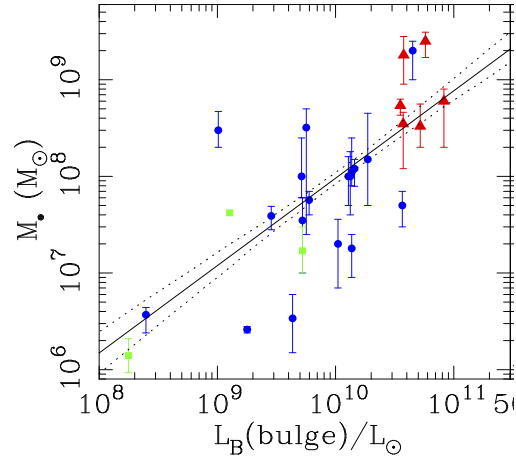 The authors find best-fit values of and , which would seem to imply that the infrared luminosities are positively correlated with both quasar luminosity and redshift. However, the authors note that there is a degeneracy in their results that is related to the method used to determine the infrared luminosities. To calculate from the Herschel data, the authors had to assume a dust temperature. As the dotted contour lines in the above plot show, if the authors assume a higher temperature, the best-fit contour lines change such that could be 0, removing the correlation between infrared luminosity and redshift. However, the best-fit contour lines result in a positive value for regardless of the temperature, allowing the authors to say that the correlation between infrared luminosity and optical quasar luminosity is robust. Thus, the primary result of this paper is that the star formation rate (as traced by the far-infrared luminosity), increases with both quasar luminosity and redshift. This result fits in nicely with current quasar feedback models, which suggest a physical interpretation where both the black hole accretion and the star formation rely on a common supply of cold gas, supplied either through cold accretion or mergers. In addition, because the relationship between star formation and quasar luminosity is not strictly linear (that is, because is not 1), the dependence of either quantity (or both), must not be linearly dependent on the gas mass.